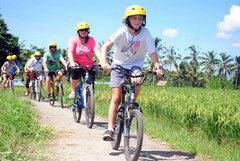 Biking trough the back roads of Lombok’s most fertile area, you will pass traditional farming irrigation systems dating back to the times of the Balinese colonialization of Lombok. 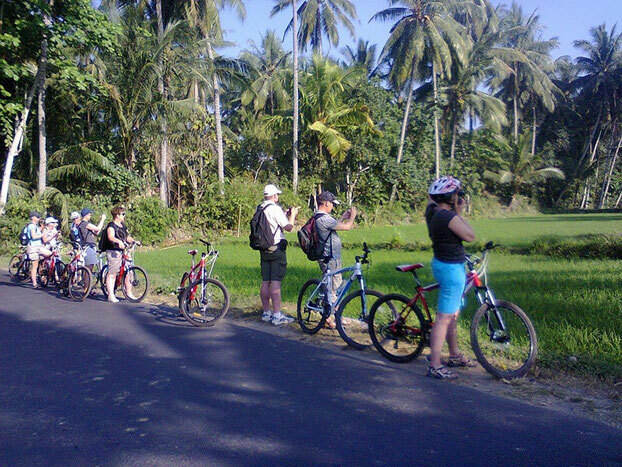 Begin the trip from your hotel around 07.30 am and drive to the starting point (Golong village) around 45 minutes drive from Senggigi area, arrival at Golong village, begin to paddle your bike through huge rice field area along the way before reach Suranadi village to explore Suranadi rain forest, you will see many kind of trees and other plantation at the forest, also you will have chance to visit Suranadi Hindus temple. After exploring the forest we will have short ride to the village to see local people making cracker from Jack fruit. After enjoying Suranadi we continue our ride to Selat village, where you can see local people making cow bell and others locals daily activity. From here we ride to Endut village, to witness inhabitant live in harmony and tolerance ( Balinese tribe and Sasak tribe ), On our ride to Lingsar temple, we will passing a grass (called Ketak )weaving village, then crossing the Lingsar green rice fields before arriving at Lingsar temple. Upon arriving at the temple you will have chance explorer around with local guide to knows more about the Muslim Wetu Telu and the Balinese temple. After enjoy the trip time back to Hotel.